déguster: to taste, to savor. disque: disc. The shape of many cheeses. épais/épaisse: thick. Some cheeses are épais, some aren’t. diamètre: diameter, as you might have guessed. But, if you don’t ask, you don’t know–sooooo many French words don’t mean what they look like in English (and vice versa). fruité: fruity. I haven’t figured out what constitutes fruitiness in the context of cheese. I’ve got pages more of cheese-related words in my notebook, but this will do for now–there’s only so many words that you can absorb at once! There’s only so many words that I can absorb at once, at any rate. What I sound like when I speak French. 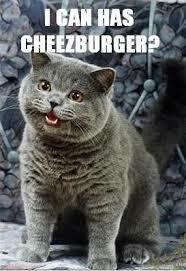 When you read my reports of conversations in this blog, you should be aware that other people’s sides are as I report them, but my side of the conversation sounds more like a French version of the “I Can Haz Cheezburger?” cat. Indeed, in this country, dogs do understand French better than I do. French children are famously well-behaved, and French dogs are similar. Although most dogs are leashed, it’s not unusual to see a dog off-leash, walking obediently behind his owner down the sidewalk, and even crossing busy streets in the crosswalk. Dogs are typically allowed in cafes, where they typically lie quietly under the table. I have no clue how French dog-owners manage this. It’s certainly not like all French dogs are well-mannered–I saw a little guy jumping up on people the other day as his owner stood talking with a group of friends in the middle of the sidewalk, oblivious. But, for the most part, it’s amazing how well-behaved these dogs are. le toutou: Affectionate word for a dog. le minet: Affectionate word for a cat. le traiteur: Caterer. I think it also might refer to a place/person that makes food to go. le comptoir: A counter (as in a bar), although I see it more often in the sense of a bar. le poulpe: Octopus. Having it for dinner, in a salad. The distribution of words in language is Zipfian, meaning that if you order words by frequency and then plot the frequency against the rank, you get a logarithmic curve. What that means: any language is full of a small number of words that occur very frequently, and an enormous number of words that rarely occur. However, they do occur. What this means for the foreign language learner is that every stinking day, you will run across words that you haven’t seen before. Here are a few random words from today–also see today’s post on the vocabulary of cell phone rental. la teinturerie: Despite the fact that the verb teinter means to dye, this is a dry cleaner. Tomme de Savoie: A mild cheese from Savoie. If I understand the web page correctly, it’s the only controlled-origin cheese that’s available at different levels of fat. la livraison: Delivery, e.g. of groceries–I came across this word at the grocery store. effacer: To erase, wipe off. With respect to computers: delete. On my new cheap French cell phone, it’s basically the delete and/or back button. insérer: To insert. Haven’t quite figured out what it means on my cell phone. le retour: Return. Seems to mean back on my cell phone. le compteur: Counter, meter. There’s a compteur de messages on my cell phone. supprimer: To remove, delete. There’s a menu item to supprimer messages on my cell phone.